No, it has nothing to do with cooking a bunny, thank goodness. But when you’re a little girl and you hear about a recipe for Welsh Rabbit, it can scar you for life. Fortunately, Welsh Rabbit is also known as Welsh Rarebit, and once you know what it is, you’ll wonder why it ever faded from the culinary scene. This classic is basically melted cheese on toast. It’s pretty much that simple. 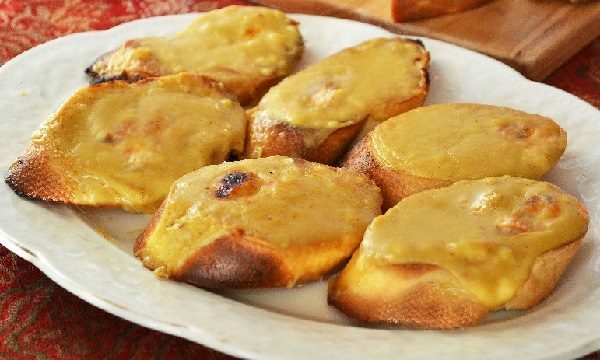 You’ll find Welsh Rarebit in your oldest cookbooks and most of the recipes are much the same–making a simple rue and then adding melted cheese, butter, a little ale, specialty mustard and a pinch of cayenne. The melted “fondue” gets poured over toasted bread and often put back in the oven broiler just long enough to bubble. It’s always served piping hot. In my 1896 copy of The Fanny Farmer Boston School Cookbook, it reads: “Welsh Rabbit or Rarebit. Which is correct? Nobody knows and it really doesn’t matter. The secret of perfection is the quality of the cheese.” While many Welsh Rarebit recipes call for cheddar cheese and pale ale, I found a recipe for smoked Gruyere and a dark ale called Smithwick’s. The combination of a robust smokey cheese and a lusty ale really kicked this Rarebit into high gear in the flavor department, and the simplicity of the preparation makes it a perfect snack, appetizer or meal anytime. I love the crunch of the toasted bread as you bite into the smooth, rich, melted cheese. It’s now a new “old” favorite and I’m good with calling it Welsh Rabbit now that I know Thumper is not involved. Heat the oven broiler to about 450 degrees. Place the bread slices on a baking sheet and toast on both sides until just lightly golden. Do not burn. Remove from the broiler but keep broiler on. In a medium saucepan over low heat, melt the butter. Add the flour and whisk constantly for about 2 minutes until well combined. Add ale, mustard, salt and pepper, whisking until smooth. Slowly add in heavy cream and whisk until well combined. Sprinkle in the cheese, a little at a time stirring constantly, until cheese is completely melted and sauce is smooth, about 3-4 minutes. Add a pinch of cayenne or hot sauce and stir. Pour immediately pour over toasted bread and place back under the broiler until cheese bubbles and starts to scorch in places. Remove from broiler and serve hot. Makes about 6-8 toasts.